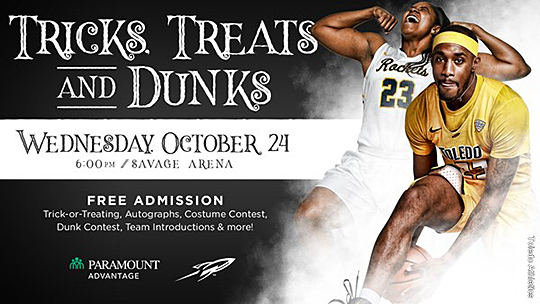 The University of Toledo will host “Tricks, Treats and Dunks,” presented by Paramount Advantage, a special basketball season preview Wednesday, Oct. 24, at 6 p.m. in Savage Arena. Admission is free. The evening will begin with trick-or-treating for kids from 6 to 7 p.m. at stations located in the arena concourses, pumpkin decorating, and a haunted house inside Fetterman Gym. Fans can dress in their Halloween costumes and get treats and prizes. Free basketball schedule posters will be provided for fans to get autographs from UT women’s and men’s basketball players. At 7 p.m., the fun moves to Nichols Court, where a contest for best Halloween costumes will be judged. Prizes will be given out to best costumes for children. There also will be raffle prizes for both fans and UT students throughout the night. Following the Halloween costume contest, the 2018-19 UT women’s and men’s basketball teams will be introduced. The Rockets will participate in a game of Knockout that will feature players from both teams, a Rocket Kids Club member, a UT student and a fan. The event will conclude with a slam-dunk contest for the men’s team. Fans can purchase snacks from the concession stands as they watch the action and listen to music from a DJ. In conjunction with “Tricks, Treats and Dunks,” the Residence Hall Association will host its annual Halloween Walk. Children and families will have the opportunity for more trick-or-treating in the residence halls following the conclusion of the event in Savage Arena. Free parking will be available in lots 3, 4 and 5, which are adjacent to Savage Arena. This entry was posted on Thursday, October 18th, 2018 at 3:14 am and is filed under Athletics, Events, News .